After announcement of resumption of relations with Chad, senior Israeli officials say Mali is next. 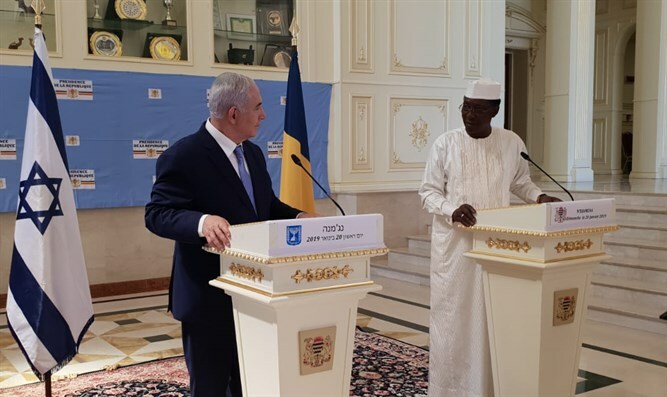 Senior Israeli officials said on Monday that there are ongoing contacts for a visit by the Prime Minister of Mali to Jerusalem even before the Israeli elections this April. After renewing relations with Chad, Prime Minister Binyamin Netanyahu is trying to carry out a similar move with Mali, a Muslim country in West Africa which suffers from terrorism. Diplomatic relations between the two countries were cut off immediately after the Yom Kippur War in 1973. The prime minister met with the president of Mali two years ago and even said after the meeting that an attempt was made to renew the relationship. On Sunday, Al-Qaeda-linked jihadists from the Nusrat al-Islam organization claimed an attack on a United Nations peacekeeping base in Mali, saying the attack was in response to Chad’s renewal of diplomatic relations with Israel. At least 10 peacekeepers were killed in the attack and 25 wounded, the UN mission in Mali said. Mali is under threat from a number of extremist groups affiliated with Al-Qaeda and the Islamic State (ISIS) organization, and attacks have moved from the north to central Mali. French forces intervened in Mali in 2013 to drive back fighters who had hijacked a Tuareg uprising a year earlier, and some 4,000 French troops remain there. The UN Security Council then deployed peacekeepers, which have been targets of jihadists. In 2015, terrorists affiliated with Al-Qaeda attacked a hotel in the Mali capital of Bamako, taking more than 170 people hostage. During the attack, 20 hostages were killed, among them an Israeli, 58-year-old Shmuel Benalal.